*This is a post from when I was travelling, with a few added recent comments. Recently, I have had to find ways on how to calm my anxiety down. I have been getting anxiety a lot more often, so I started to look up natural ways on how to slow this down! I know that at the doctors, they can help you with either therapy or anti-depressants but I can’t exactly afford therapy whilst I’m travelling as it will cost me a fortune and I do not want to go on Anti-Depressants as people become too reliant on them and I’m scared that they could make you go crazy haha! But anyway, I looked into things like breathing exercises although I feel that these don’t really work on me yet. I would probably need a lot more practice at this? But, I found an article on Essential Oils that can really help you calm down and you can use them in so many different ways! You can use this in so many different ways, you can vaporise it and inhale, simply inhale from the bottle, use as a massage oil, blend together with a natural non-fragranced moisturiser, make your sheets smell great by putting a bit of the oil onto a wash cloth and placing it into the tumble dryer or like I use it, I place some oil onto cotton wool before I go to bed, and place these inside my pillow case and I feel like it really helps me to calm down! WARNING: Do not put some oils straight onto a pillow case, as I found out the horrid way, some of the oils are clear. So this left a horrid yellow blob on my hostel pillow – which I don’t think housekeeping will be too happy about.. RECENT COMMENTS: I have still been loving Essential Oils whilst still on the waiting list for Cognitive Behaviour Therapy. Even today I have purchased more, I have bought Ylang Ylang and a bottle of Bergamot and have turned them into Room Sprays and Body Sprays. I put 100ml water into a spray bottle and have put in 20 drops Ylang Ylang and 10 drops of Bergamot and it smells incredible! Soothing but also Uplifting! I have also made up one solution of purely 30 drops of Ylang Ylang which smells incredible at the moment! I am going to be creating lotions tomorrow and I’ll keep you posted on how that goes too! At least I can carry some lotions around with me on the go and use the sprays for a long lasting scent! I have also found that whilst I’m on the go, I can’t exactly just whap out my essential oils and start sniffing away! 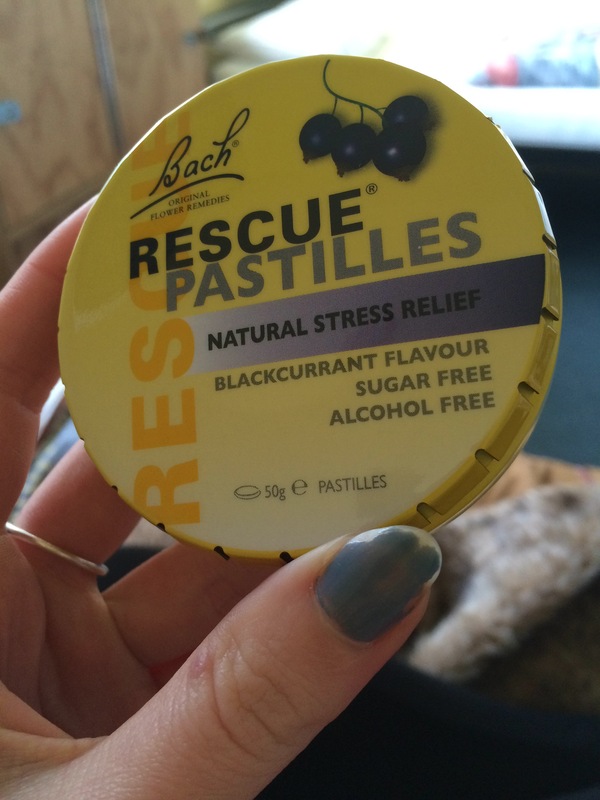 My friend told me about the Bach ‘Rescue’ range – they make Rescue Remedy spray, drops (that you can put into drinks or simply put onto the tongue) and they make Pastilles that you can chew on. These contains a certain type of blend that really helps to calm you down (I WILL LOOK THIS UP AGAIN, OF COURSE). I have only tried the one so far, but I feel like it actually helped me, but hey, it was my first time using it! I will try them again when I get pretty stressed out and I will get back to you. These are also natural, so they aren’t bad for you! I just find that it’s a lot better to possibly try the natural methods first, before jumping into Anti-Depressants and other medication to calm you down! I feel like you should try to go about doing what you really enjoy in life, if it’s doing a sport, exercising, walking or listening to music – I feel that doing the things that you enjoy can calm you down, especially if it’s exercise! I feel like reading is a very good way to calm myself down. I tend to find a quiet corner and settle down with my book, or even head to the library. I know that everybody is different though, but this is one of my calming methods that I have found that works for me. I will post some links to these products underneath, and if I re-find the articles that really helped me I will post them too! Keep your eyes peeled for some posts on Aromatherapy and what I am starting to put together, soon! Glad to hear that you can manage everything now! Luckily I’m not the physical, fainting, blacking out sort of anxiety!